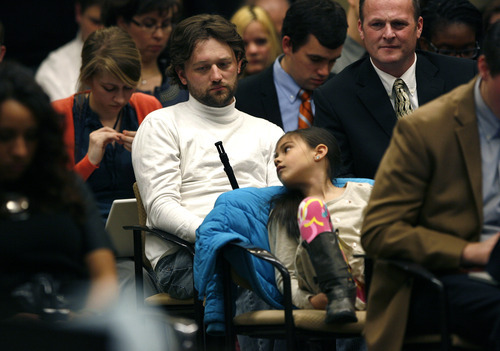 Utah House • Lawmakers advance bill to get rid of concealed-carry permits. Scott Sommerdorf | The Salt Lake Tribune Mathew Chappel (cq) of Salt Lake, who brought his Ruger Mini 30 to the committee meeting where Rep. Brian Greene's HB114 was heard, waits for his turn to speak on the bill, Wednesday, February 20, 2013. Myle Villanueva, 5, sits in front of Chappel. The bill was put on hold after a motion to adjourn was upheld by 5-4 vote. 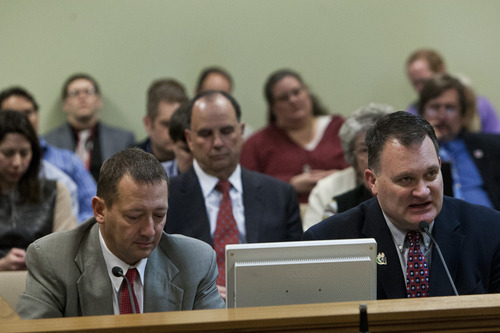 Chris Detrick | The Salt Lake Tribune Clark Aposhian, chairman of the Utah Shooting Sports Council, speaks about HB268 Disorderly Conduct Amendments, during a House Law Enforcement and Criminal Justice Committee meeting Wednesday February 20, 2013. At left is Representative Paul Ray, R-Clearfield. Scott Sommerdorf | The Salt Lake Tribune Michael Fidler, 18, got up to show the committee members hearing HB76 his sidearm that he openly carries as his father, Sam Fidler, spoke about it during the public comments phase of the hearing of the bill authored by Rep. John Mathis, R-Vernal, foreground, Wednesday, February 20, 2013. 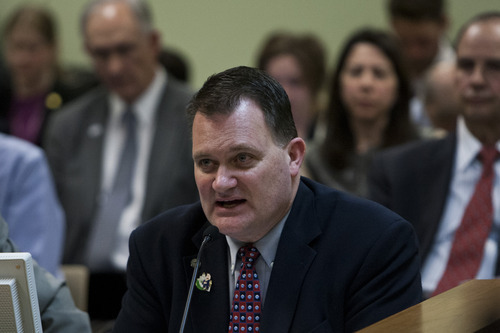 Chris Detrick | The Salt Lake Tribune Clark Aposhian, chairman of the Utah Shooting Sports Council, speaks about HB121 Firearms Safe Harbor, during a House Law Enforcement and Criminal Justice Committee meeting Wednesday February 20, 2013. At right is Representative Dixon Pitcher, R-Ogden. 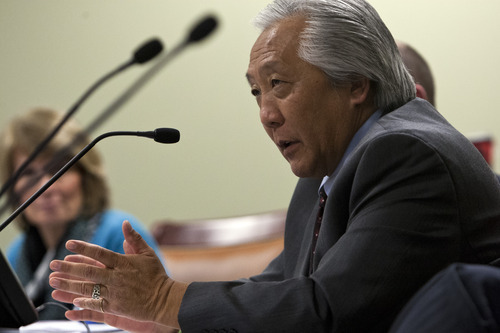 Chris Detrick | The Salt Lake Tribune Committee Chair Rep. Curtis Oda, R-Clearfield, speaks about HB121 Firearms Safe Harbor, during a House Law Enforcement and Criminal Justice Committee meeting Wednesday February 20, 2013. 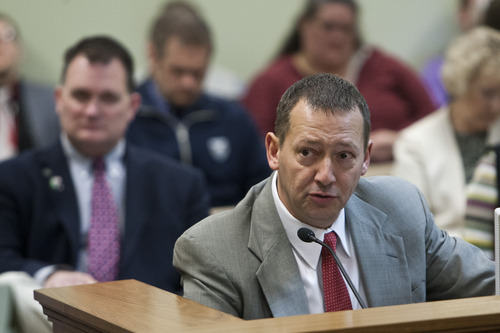 Chris Detrick | The Salt Lake Tribune Clark Aposhian, chairman of the Utah Shooting Sports Council, speaks about HB268 Disorderly Conduct Amendments, during a House Law Enforcement and Criminal Justice Committee meeting Wednesday February 20, 2013. Chris Detrick | The Salt Lake Tribune Representative Paul Ray, R-Clearfield, speaks about HB268 Disorderly Conduct Amendments, during a House Law Enforcement and Criminal Justice Committee meeting Wednesday February 20, 2013. Scott Sommerdorf | The Salt Lake Tribune Rep. Brian Greene, R-Pleasant Grove, right, talks with Mathew Chappel (cq) of Salt Lake who brought his Ruger Mini 30 to the committee meeting where Greene's HB114 was heard, Wednesday, February 20, 2013. The bill was put on hold after a motion to adjourn was upheld by 5-4 vote. Later supporters of the bill tried to block cameras from taking photos of Greene near the gun saying it did not help getting the bill passed. Scott Sommerdorf | The Salt Lake Tribune Mathew Chappel (cq) of Salt Lake, who brought his Ruger Mini 30 to the committee meeting where Rep. Brian Greene's HB114 was heard, waits for his turn to speak on the bill, Wednesday, February 20, 2013. Myle Villanueva, 5, leans back to look around the room as the hearing goes on. The bill was put on hold after a motion to adjourn was upheld by 5-4 vote. 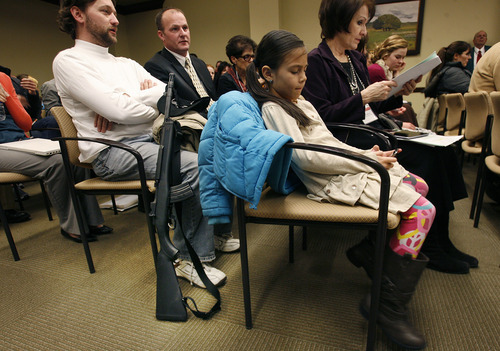 Four gun bills passed through House committees Wednesday, including a high-profile measure that would have Utah join a series of states in allowing its residents the right to carry a concealed firearm without a permit. That proposal, HB76, packed a hearing room and left people standing along the walls and featured at least one man showing off his black semi-automatic assault rifle to interested spectators taking pictures of it. "I have the right by law to carry this," Mathew Chappel said. "I don&apos;t have any intention to harm anybody." Rep. John Mathis, R-Vernal, sponsored the so-called constitutional carry measure modeled closely after Vermont&apos;s existing law. He said he "struggled" with the idea of bringing it forward this legislative session but believed it was necessary. He said it was proving inconvenient for people to worry about a jacket or untucked shirt accidently covering their firearm  a slip that would put them at odds with the law. Currently in Utah, a permit must be obtained to carry a concealed firearm. 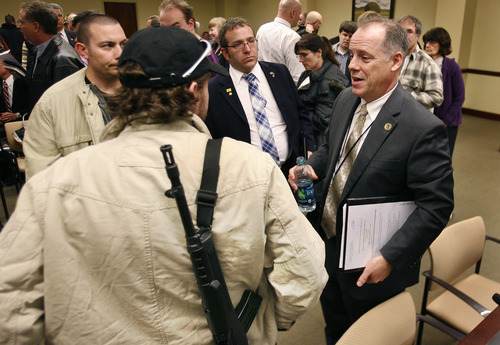 But Mathis also acknowledged  under strong questioning from Rep. Brian King, D-Salt Lake City  that his bill would allow people to carry loaded firearms openly. Under current law, weapons cannot have a round in the chamber if openly carried. "In my world, we use horses ... we go fishing and it&apos;s quite common to carry a gun on a saddle," Mathis said. "If I didn&apos;t have a concealed-weapons permit, I have to have the gun unloaded to carry with me." King said he feared the bill would encourage more people to buy guns and lead to a rash of accidental discharges of guns as well as having weapons present in escalating circumstances where tensions would run high. Jean Hill, spokeswoman for the Catholic Diocese of Salt Lake City, said the idea of arming more people ran counter working toward a peaceful society. "Eliminating the very few restrictions Utah has on carrying deadly firearms fosters a particular culture in this state," Hill said. "This bill sends a clear message about Utah values and the message we think it sends ... is that Utah values firearms more than the culture of life." Initially it appeared there would be no criticism of the measure and the room broke out into applause when Chairman Kay McIff announced there weren&apos;t any opponents to the Mathis bill. But several ended up speaking against it  including Miriam Walkingshaw, of the newly created group Utah Parents against Gun Violence. 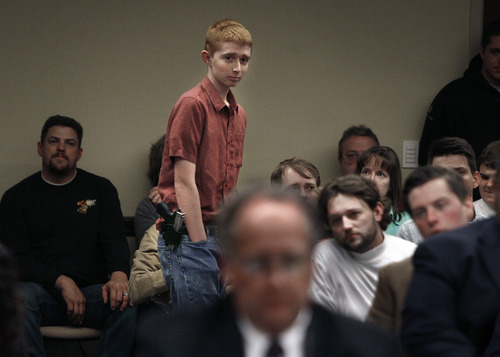 The hearing on HB76 lasted for more than an hour and was also highlighted by Sam Fidler, who asked for his 18-year-old son to stand and demonstrate how he wasn&apos;t a threat to anyone while having a gun strapped to his waist. And another man was almost arrested by Utah Highway Patrol officers after he commandeered the microphone and began speaking to the bills. He eventually returned to his seat. While the committee hearing was packed, it thinned out for the other measure carried by Rep. Brian Greene, R-Pleasant Grove. 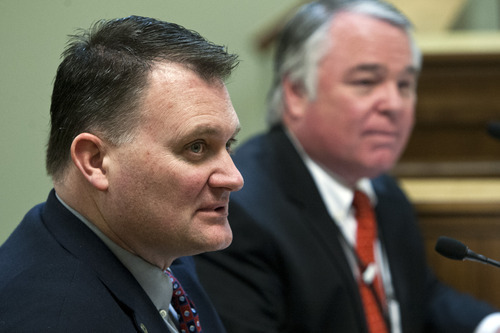 His proposal, HB114, ended up being held until Friday after it went through a myriad of changes centered around its most controversial provision  allowing local sheriffs to arrest federal agents if there was an attempt to seize guns from Utah residents. That proposal, he said, was spurred by fears of a massive effort by the federal government to impose tougher restrictions outlined by President Barack Obama that included reduced magazine capacity, tougher background checks and a ban on assault weapons. Greene also said his bill, entitled "Second Amendment Preservation Act" was not a firearms bill. "What it is is a reaffirmation of state sovereignty and liberty," he said. After the meeting and the crowd spilled out into the hallway, Rep. Curt Oda, R-Clearfield, found Chappel and, irritated, told the Taylorsville man he was "hurting the cause." Across the hall, more gun bills faced less controversy and were passed out of committee on what became known on Capitol Hill as "Gun Day." Rep. Paul Ray, R-Clearfield, saw his HB268 seeking to remove disorderly conduct as a charge that could be leveled at a citizen for simply displaying a weapon pass easily through the House Committee 7-3. If the constitutional carry bill becomes law, Ray said his bill becomes even more important than it otherwise would be. There have been several instances recently where people have taken assault rifles or other weapons to malls or public places, creating a disturbance. "What we are trying to do is prevent the person who is legally and lawfully carrying a gun from getting cited for disorderly conduct," Ray said. Those who take an assault rifle to the mall deserve to be ticketed, Ray said. "I 100 percent support the Second Amendment, but I don&apos;t support someone who doesn&apos;t do it responsibly," Ray said. The committee passed two other gun-related bills. One, HB211, would exempt service members stationed in Utah and their spouses from a requirement that they get a concealed weapons permit in his or her home state before getting one in Utah. The other, HB121, would let gun owners or their cohabitant family members turn their firearms over to police for up to 60 days if they feel they could harm themselves or others.